“No hate, no fear. Refugees are welcome here,” about 60 Emory students — the majority of whom were Rollins School of Public Health (RSPH) graduate students — shouted during a Feb. 2 demonstration to “stand up” and “speak out” against President Donald J. Trump’s executive order on immigration. Trump’s Jan. 27 executive order bans citizens of seven Muslim-majority countries from entering the United States for 90 days and indefinitely bars refugees from entering the country. 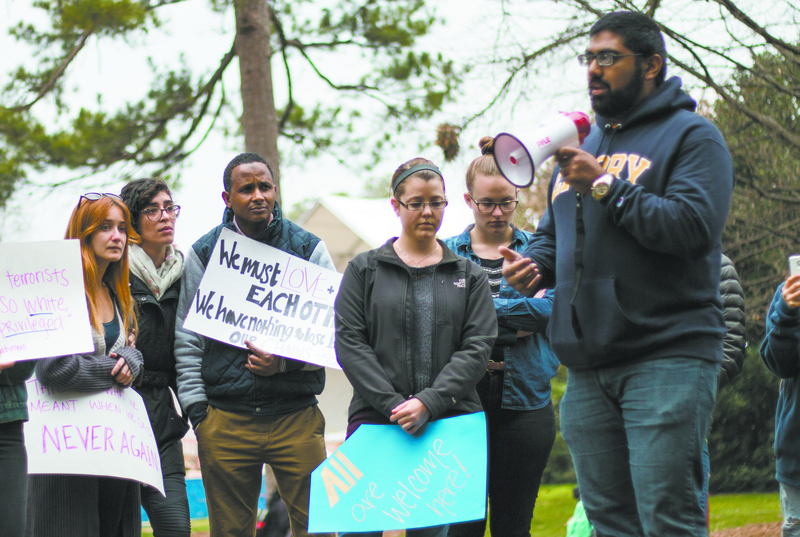 Organized by eight RSPH graduate students, the demonstration included speeches urging the crowd to support those affected by the executive order, and featured personal stories from Emory Muslims, immigrants and refugees. The event occurred in the area between Asbury Circle and Dobbs University Center (DUC). Students from the Candler School of Theology Jewish-Christian-Muslim Dialogue class shared their support, opening the discussion for others to present poems and personal narratives about how the immigration ban impacted Emory students. Assistant Professor in the Practice of History of Religions and Multifaith Relations Deanna Ferree Womack gave her class a half-hour break to attend and participate in the demonstration. RSPH second-year Shannon Clawson said she appreciated one student’s reflection about how the story of her parents — who fled from Vietnam to the United States during the Vietnam War — would be different if it took place today because of the executive order. Laney Graduate School student Mohamed Amgad said that the “widespread empathy” expressed at the event compelled him to speak about the positive economic impact immigrants can bring to any country, including the United States, through their hard work and innovative ideas. All eight event organizers declined to comment. A Seattle federal judge ruled Friday, one day after the demonstration, that two parts of Trump’s executive order — barring refugees and citizens of seven countries from entering the United States — could not be enforced nationwide.